Celebrating 50 years of business excellence, TRE architecture is an award-winning architecture practice located in Carlsbad, California, serving San Diego County and the surrounding Southern California areas. TRE is the Italian translation of the number three, as well as the mission at the core of the business to provide sustainable, livable, and beautiful architecture. TRE’s history began in 1967 when Amato Teta founded the practice after completing his studies at Carnegie Mellon University. Years later, Allan Teta now follows in his father’s footsteps, after receiving his Bachelors of Architecture at the University of Southern California. TRE is where they say architecture is their passion and a happy customer is their goal. They have been featured in the San Diego Union Tribune. 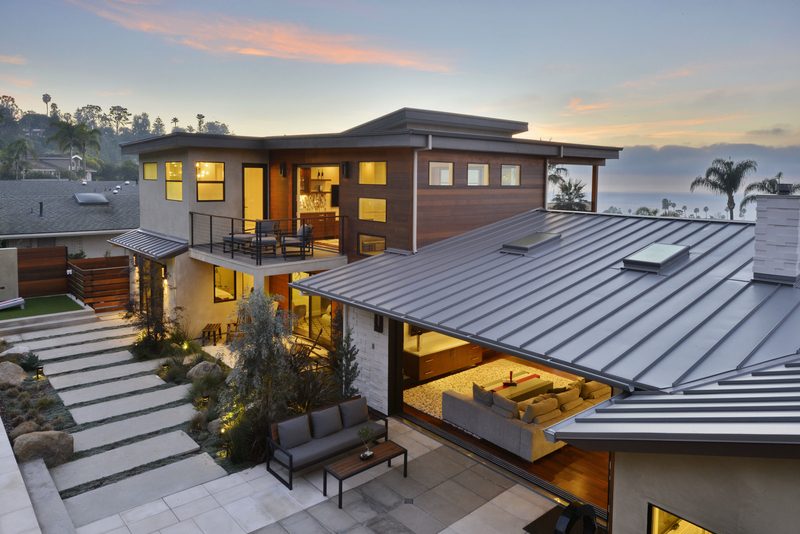 One of the homes designed by TRE Architecture was featured in the San Diego Union Tribune. The home is inspired by an island theme. The first floor features a dining room with a wine room, large beautiful kitchen with a standout teal backsplash, a media room, a great room with a slider that opens to the large outdoor seating area, a lanai, and a guesthouse. On the second floor is the home office and master suite with a beautiful outdoor deck. ,“The Ritual House” another of TRE Architecture’s designs, was featured on Fox News 5 as the crane lifted a part of the house and set it in place. The home was designed by TRE Architecture, but first built off-site and then set in place by a crane that weighed 275 tons. The million-dollar beach house in Carlsbad features a steel glass panel observation deck, an elevator, 4,600 square feet of living space, five bedrooms, and a media game room in the basement. About Kim Grant Design, Inc.
Kim Grand Design, Inc. is an award-winning Architectural Firm that has specialized in historic properties and coastal area homes since 2002. The firm has become part of San Diego’s important evolution by creating architecture that restores and revitalizes its unique history. Kim’s background in traditional architectural styles has proven extremely useful, as the firm develops designs that showcase the style and era their clients are interested in while integrating modern conveniences into each design. The results are always unique spaces that are reflections of their clients’ needs and desires. Among others, the firm has been awarded various Historic Preservation Awards and the Remodel of the Year Award by San Diego Home and Garden Magazine in 2015. One of the firm’s major projects was an Irving Gill renovation in San Diego that stayed true to the historic essence of the home, which was chosen as the “Home of the Year” by San Diego Home & Garden Magazine. The 7th Avenue Historic District residence was restored by adding windows to a second-floor open sleeping quarters. They added 10 feet of space to create a spacious family room but preserved a brick chimney in its original form to add the timelessness to the room. The firm also restored a beautiful 1920s Spanish eclectic residence that was dedicated as a historic landmark by the city of San Diego. The firm gave the home a new breath of life by restoring the exterior, restring and motorizing its beautiful original iron gates, and adding a master study, master bath, new pool, spa, and outdoor barbecue area as well as a fireplace. The result is a gorgeous residence that stays true to its roots down to the very last corbel. House Design Architects (formerly known as House and Dodge Design) founded by Mark T. House is a San Diego-based architectural practice with over 25 years of experience in residential home design. Their portfolio consists of work that includes both modern and traditional residential projects. Over the years they have developed a seven-step process to their work, from the very first step of introductions to the client moving into their dream home. Throughout this process, the firm provides seamless management and open collaboration with the teams involved to achieve their goal of delivering quality service with excellent design. House Design Architects believes architecture is not only functional, but also timeless, engaging, and unique. Their design of the Anderson Ridge house in the Del Mar area of San Diego is a breathtaking combination with traditional elegance, including high columns, natural stones, decorative iron railings both indoor and outdoor, romantic archways, and a spiraling wooden stairwell. The design is a perfect example of old world romance meets modern day functionality, with amenities like a stand-alone soaking tub in the master bath and an exquisite metal chandelier with pearl beading suspended over it. A La Jolla Shores pool house is another of their breathtaking designs. The house features an expansive great room with wood beams adding warmth and timelessness to the design. There are large french doors that open on both sides of the room leading into the outdoor seating areas. A beautiful stone fireplace is the focal point, accented by built-in cabinetry on either side. Two massive chandeliers grace the room with extra light, giving the space a worldly, sophisticated feel. Hauck Architecture is a LEED-accredited and Green Building Professional-certified architectural firm based in San Diego and founded in 1996. The team is led by T. Dustin Hauck, Principal, who received his bachelor’s degree from the Hammons School of Architecture at Drury University and studied at the Edinburgh College of Art in Scotland. Led by Hauck, the firm is committed to identifying green and sustainable designs that decrease the environmental impact of their work while increasing the efficiency of their designs. With each project, the firm strives to listen carefully to their client’s goals and dreams and engage them by making suggestions that go beyond just meeting the client’s needs. A custom home comprised of over 2,200 square feet of indoor living space and over 1,400 square feet of outdoor living area was designed by Hauck Architecture in the Solana Beach area of San Diego. The home includes an open entertaining area with wide ocean views, three bedrooms, and three full bathrooms. With this design, the team is leading the way in green designs by exceeding State of California Title 24 energy efficiency requirements by over 50 percent. This project became the first home in the Solana Beach area of San Diego and the third ever in San Diego County to receive New Home Green Point Rated certification through Build It Green. The home also includes Low VOC (Volatile Organic Compounds) finishes and low-emitting insulation for improved indoor air quality. The neighborhood of Solana Beach welcomed another Hauck design with the complete remodel and addition of a new second floor, which includes a master suite, two kids’ rooms, and a study area. The additions make a small footprint, using environmentally responsible materials including eco-friendly insulation. The mindful use of natural daylight almost completely eliminates the need for artificial lighting in the home during the day. This project has the Solana Beach community excited about green designs. At LUCE et Studio, they believe that architecture is a conversation — that exceptional design happens through inquisitive exchange between client and architect, and that conversation holds the power to transform and surpass expectation. Jennifer Luce leads the architectural design team at LUCE et Studio. She received her Bachelor of Architecture with Distinction from Carleton University, which recognized her with the 2007 A. Dunton Alumni Award of Distinction. Jennifer earned a master’s degree in design studies from Harvard University’s Graduate School of Design, and she serves on the Alumni Advisory Council for both universities. She believes that architecture is a conversation and collaborative process. Consisting of 2,500 square feet the Felkner-Lehman Loft remodel resulted in an industrial design that feels utilitarian and minimalist, with exposed wood and steel beams; a barely there stairwell; tall, exposed, red brick walls; and exposed piping and air conditioning vents. The space is artistic, beautiful, and edgy, with the upscale air of a true artist’s loft. The firm takes a different turn with the next residential design. While everything seemed to be exposed in the previous one, nothing is exposed here. We have clean, white lines joined by soft grey lines and the occasional contrasting clean back line, like in the design of the minimalist black fireplace. This residence is located in La Jolla, California. It is a 2,300-square-foot edgy design with geometric wall divisions, a minimalist clean kitchen, and floor-to-ceiling windows that invite the natural light. Award-winning architect Mark A. Silva has 28 years of experience in residential architecture and creates beautiful places as a reflection of his client’s dreams. He ensures that every project is a perfect fusion of these dreams, the personality of the site, and the natural authenticity of architecture. His designs break apart the idea of space and redefine the concept of home. An almost entirely glass room with views of the hills reimagines the bedroom, and in a city where life is lived outdoors as much as it is lived indoors, he creates perfect environments to enjoy this concept to its fullest — and therefore life to its fullest. Mark Silva was featured in an HGTV episode about San Diego’s residential architecture. 505architecture’s stunning design of a geometrically inspired residence has intense bold movements. It is a unique space in the Del Mar area of San Diego, with the feel of a cutting-edge museum. The house is high in the hills with views of the ocean, and the design lends itself well to its locale. It has sharp corners, steep climbs, and an intentional grace, with a jutting wall that extends out from the house over a cliff. The movement amazes and delights. Continuations of the jutting wall are found throughout the house, grounding and securing the mind. A piece of it is the wall that passes through the living area, where the big screen TV hangs. It moves across the structure to the front of the house, creating an intentionally uniform design, and a hold on the house that is grounding and transformative. A similarly cutting-edge design was implemented for a residence called “Can Deus.” Every inch of the house showcases the beauty of the outdoors — the ocean beyond and the hills up close. Enter through the large, wooden front door, and the idea of entering into a room falls apart, as we enter into the ocean visible through the tall glass walls on the other side. A minimalist stairwell leads up to the second floor. An abundant use of glass, wood, and steel throughout the space feels organic. In a bedroom, there is a natural stone wall that continues out to the outdoor seating area — making for a perfect dialogue between the outdoors and indoors and all of the rooms within. The house in sum takes every advantage of the beauty of its surroundings and brings them into the experience of being present. IS Architecture is an award-winning firm dedicated to the preservation and renewal of our built environment. Led by Ione R. Stiegler, Fellow of the American Institute of Architects (FAIA) and Principal Architect, the firm specializes in custom residential architecture and the historic restoration and adaptive reuse of existing structures. The firm’s philosophy states that the purpose of architecture is to create buildings that are well-built, functionally efficient, aesthetically pleasing, and appropriate to both the clients’ requests and a project’s location. Scale and proportion are critical — both in the relation of the rooms to each other and the house to the property outside. Among the firm’s many awards is the 2015 National Association of Home Builders (NAHB) Best in American Living Home Of The Year Award, as well as the San Diego Home & Garden Home Of The Year Award in 2013. The current owners of a historic residence in the Mission Hills area of San Diego wanted to preserve their home’s historic integrity while creating a light-filled, enjoyable and livable interior within the existing footprint. After IS Architecture redesigned it, the home’s interior became bright and welcoming, while still full of its original charm. The new, modern kitchen is the centerpiece, blending classic “arts and crafts” style with the homeowner’s clean-lined tastes. To improve movement in the home, the design team removed a pantry closet and created a new Craftsman-style passage to the living room, taking advantage of its backyard views. Also, a covered porch replaces a deck off the kitchen and offers seamless indoor-outdoor living, exposing the beautiful canyon views. Mark Lee Christopher has been a licensed architect for over 30 years, and his firm has been awarded nine Home Of The Year Awards, an AIA Honor Award, and the City of San Diego Historic Resources Board Award of Excellence, among others. Since its founding in 1987, his LEED-certified firm has been creating extraordinary buildings of high design quality and diverse styles with a value placed on the integrity and lasting quality of good design. They are committed to creating environments that are both beautiful and a joy to experience, and they are experts in the use of 3D computer technologies throughout the design process to help their clients visualize and experience the end product even before project completion. The firm’s design of the beautiful “Windansea Home” was awarded the Home Of The Year Award by San Diego Home and Garden Magazine. It is a three-story residence in the La Jolla area that blends modern and traditional elements, uses rich wood finishes, has a central iron railed stairwell that visually connects the home, and has windows that open to beautiful ocean views. There is a playroom/wine room, a greatroom with vaulted ceilings, and a wood beam accent spanning across the area that adds an element of warmth to the space. The home incorporates many outdoor seating areas to enjoy the beautiful scenery, and it features a dream pool and magnificent views of the coastal scenery beyond. Beautiful builtins, warm and welcoming beams, and bright light through the plentitude of windows grace this beautiful transformation residence called “Young.” The space is a brilliant amalgamation of the Craftsman-style architecture highlighted with unintrusive modern elements intended for today’s busy lifestyle. The beautiful beams are carried throughout the home from the living area to the bedrooms, where in large french doors open to a green outdoor seating area that beckons a more relaxed, quiet, and reflective state of mind. Christian Rice Architects is an AIA award-winning architectural practice based in Coronado, California, where they strive to design and create architecture that responds mindfully to the site, and respects the surrounding environment and the needs of each client they represent. The firm is committed to seamless project management, which they believe is achieved through open collaboration with each member of the design and construction team. They are dedicated to creating timeless architecture that is not only functional, but also engaging and unique. The firm has received numerous awards, including the 2016 President’s Award from The American Institute of Architects San Diego chapter and has been featured in many local and national publications. The firm designed the Alameda Residence, a spectacular home that was featured in Luxe Magazine. It is situated on a large, unusually shaped lot in San Diego’s beachside community of Coronado, California. The L-shaped main home and linear-shaped guest house and covered patio create a large, open courtyard central to the plan. The home surrounds the courtyard, creating a sense of openness and light. The design resembles a simple, clean “A-frame” barn, intermixed with sleek, minimal detailing that gives the home a contemporary flair. The bright, vibrant hues and textures of materials reflect the seaside lifestyle. For the Georgia Street residence in San Diego, the owner wanted to take the roof off the existing structure and create a two-story contemporary home full of energy and color, and add new elements for better indoor-outdoor living. To accomplish these goals, the team incorporated several new features, including the addition of a glass garage door that opens vertically into the entry area. The new steel roof projects out to create a front porch and covered outdoor dining area, and there is a new balcony along the rear façade. Together these elements make the San Diego residence a better fit for its sunny locale, where outdoor living is as common as indoor life. About Architect Mark D. Lyon, Inc. Architect Mark D. Lyon has over 30 years of experience assisting clients in making their dream homes become a reality. He has designed more than 500 beautiful homes throughout Southern California, and he has earned a reputation for unique imaginative designs, being able to adhere to the client’s individuals goals, budget, and schedule. He knows the steps needed to achieve the most beauty, quality, and value for his clients to ensure their unwavering satisfaction, and in this effort he is unrivaled in the field. The firm loves the work they do, sharing in the joy and excitement their clients experience as they see their dream home take shape before their eyes. 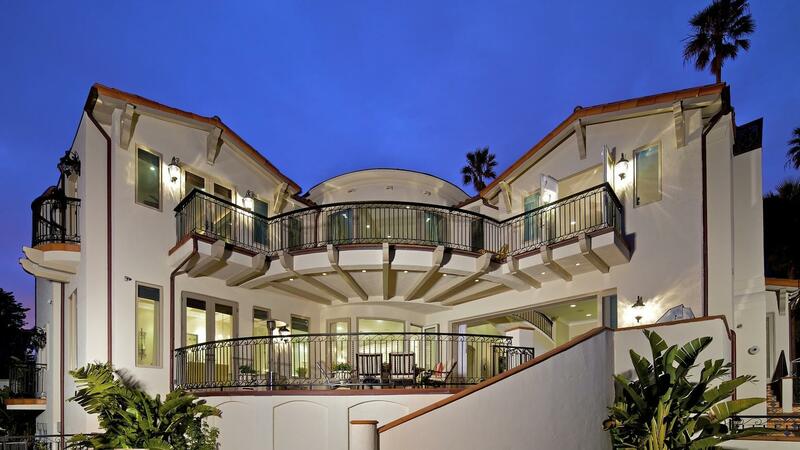 One of the firm’s many projects is called “Avenida Cresta,” located in one of the most prestigious areas of La Jolla, with early-1900s Spanish Colonial architecture that was masterfully remodeled in 2009. The home is a breathtaking beauty on the beach with five bedrooms, each of which has its own bath, as well as an additional three powder rooms. Other amazing features include east- and west-wing architecture that allows sunrise and sunset views from the main living areas and decks. There is a basement with a car lift and parking for more than five cars. A 1950s bomb shelter was masterfully converted into an impressive wine cellar. Rooms are accented by high ceilings, and the living room is warmed by a beautiful fireplace and custom built-ins. There is an amazing live coral reef aquarium shared by the living room and adjacent office, and an elevator serves the house from the basement to the top floor. Another of Mark’s designs was a challenging project, as it sat on a small lot, but the firm was able to maximize every inch of the space by incorporating a subterranean garage. To accomplish this, they had to stabilize the neighboring residence and begin with extremely robust foundations to support the three-story structure. Designed around a central William Ohs custom kitchen, the new home has breathtaking views of the ocean, includes modern conveniences, and has a rooftop terrace with fantastic ocean views.